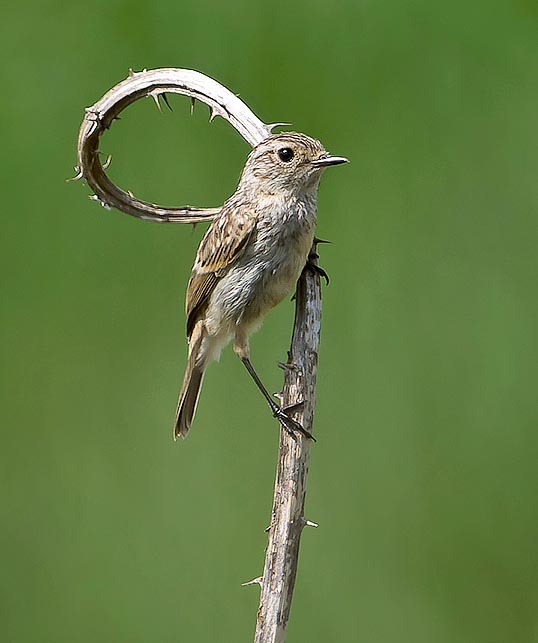 The Spotted flycatcher (Muscicapa striata Pallas, 1764) is a nice small bird belonging to the order of the Passeriformes and to the family of the Muscicapidae, a bird perhaps more known due to its symbolic and folkloric name than for its morphological characteristics. 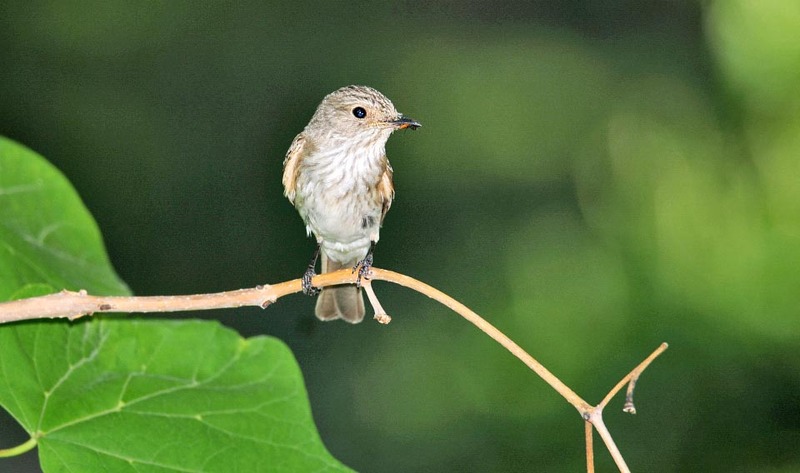 As a matter of fact, as soon as you pronounce its name, immediately we ideally chase those exotic flycatchers of far away lands, imagining clamorous shapes and colours even if we have never seen and known them. Contrarily to our imaginations, this bird is to be considered morphologically as standing among the most insignificant, not having any physical characteristic easy to remind and neither colours such to render it recognizable among the many birds present in our skies. 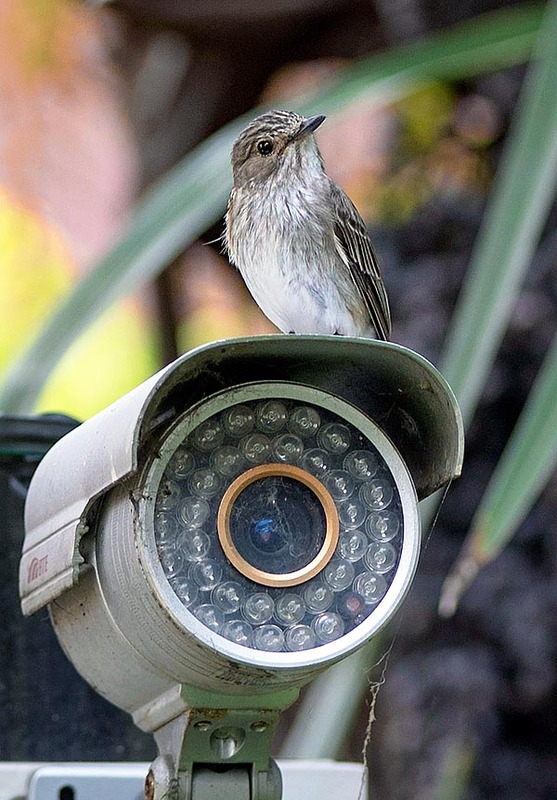 If instead we wish to assign to the flycatcher an epithet that identifies it without any doubt and describes in only one term its peculiar characteristics, here the operation reveals quite easy: elusiveness. There is not a bird so much reserved and careful as the flycatcher. Despite having it quite often between our feet, as it is fairly common and anthropized, we do not even realize of having its nest in our garden, a few steps from where we live, such is the discretion and the evasiveness of this small being. At most we note occasionally a quick flick, fleeting and colourless of what may seem a small bird but at once passed unnoticed, seen that suddenly, after a few metres, it stops staying still as a statue and camouflaging itself with the environment around. And then one day watering the flowers on the balcony or hanging the washing out to dry or reading the electricity metre, here is a nest with chicks that widen disproportionately those lemon yellow hungry mouths as if they wanted to revenge for the sudden discovery. As a matter of fact the flower pots, the basket of laundry pegs and the niches created by the boxes of the external counters stand among their preferred sites where to nidify. And that’s not all! When brooding their elusiveness becomes exasperating and such to render even more invisible its presence. If the brood is in the initial phases, as soon as it notes our arrival even far away, it leaves the nest throws itself to the ground with a vertical dive, as if it was a leaf fallen from a tree and flying low very close to the ground disappears vanishes in the air. Conversely, in the final phases of the brooding, its immobility, favoured also by the absolute absence of colour, allows the bird to remain crouched on the nest till unbelievably reduced distances without showing any fear. It is also a silent bird and rarely emits sounds or songs apart the typical “uitt cek cek” of alarm light and low, when it has the chicks in the nest or when they have just flown out. Instead, characteristic is the way of hunting that distinguishes it from any other bird present in our lands. Still on a well exposed small branch, almost vertical, observes attentively the surrounding sky showing a nervousness that sees it shaking rapidly with impulsive springs wings and tail, ready to leap upward as soon as a small insects passes flying. With a very fast movement and with a few metres flight here it is catching infallibly the ill-fated insect and quickly going back to the starting point. An almost unperceived action but signalled by the noise caused by the abrupt closure of the jaws. The etymology of the scientific name derives the genus Muscicapa from the merging of two Latin terms “musca” = fly and “capere” = to catch, whilst the species striata gets origin from the light striations it has on the throat and the chest. As rarely occurs to attentive ornithologists as are the Anglo-Saxons, in English to this small bird has been given a wrong vulgar name, calling it Spotted Flycatcher instead of a more probable Striped Flycatcher recalling the presence in its livery of pois instead of the light stripes. Often in the identification manuals of this species is written a nice notice inviting not to look for roundish spots in this small bird because you will not find any! In Europe it is called Gobemouche gris in French, Papamoscas gris in Spanish, Papa-moscas-cinzento in Portuguese, Pigliamosche in Italian and Grauschnäpper in German. 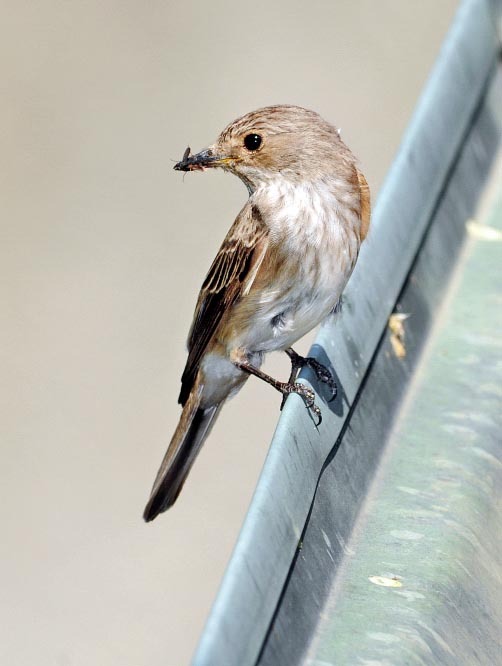 The spotted flycatcher is a long range migrant reaching the summer ranges falling behind on the spring migrations as it reaches the sites of reproduction by the beginning of the month of May and goes back to the winter quarters already by the month of August. 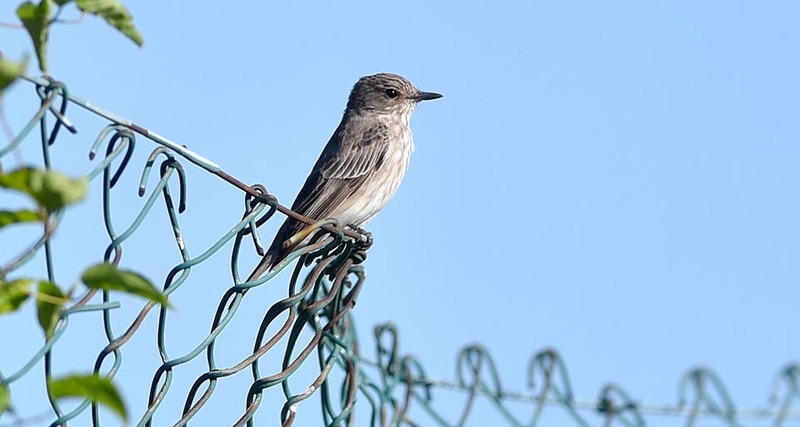 The nidification range of the spotted flycatcher is very vast and includes entirely Europe but Iceland, Asia up to Mongolia and southward to touch Afghanistan, Pakistan, Iran and Middle East. It is absent in the Arabian peninsula and in the regions south to the Himalayan chains. In Africa is present in Morocco, Algeria and Tunisia in the territories close to the Mediterranean coasts. In Italy it regularly nests all over the territory, islands included, with an overall European population of about 7 millions of couples. The European populations and most of the western Asia ones winter in the sub-Saharan area up to South Africa whilst the central Asian ones reach the Indian subcontinent. 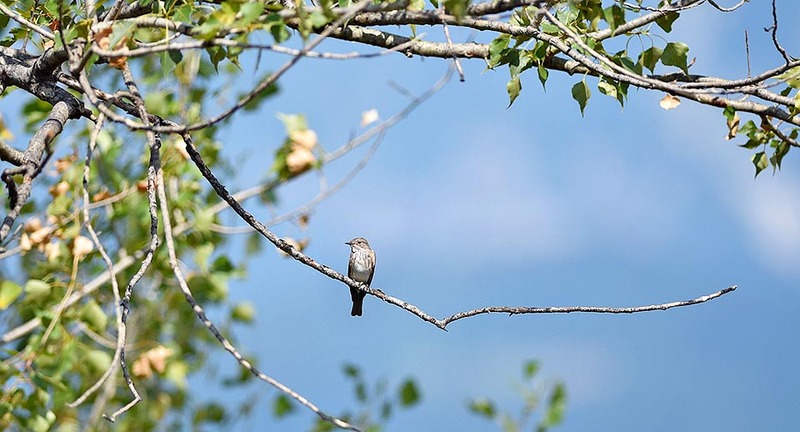 The spotted flycatcher lives in any, even densely, wooded area surrounded by ample free spaces where it can practice the preferred activity from which has gotten the name. It is commonly present also in city parks, small gardens, orchards, rows of trees that cross cultivated countries and livestock breedings, practically all the places where insects are present. As mentioned before, it does not fear the man and this social behavior has led it to occupy any available rural environment. It has been also able to exploit quickly and with opportunism the new trend which is spreading of placing nest boxes in the garden to attract the usual small birds we have around. 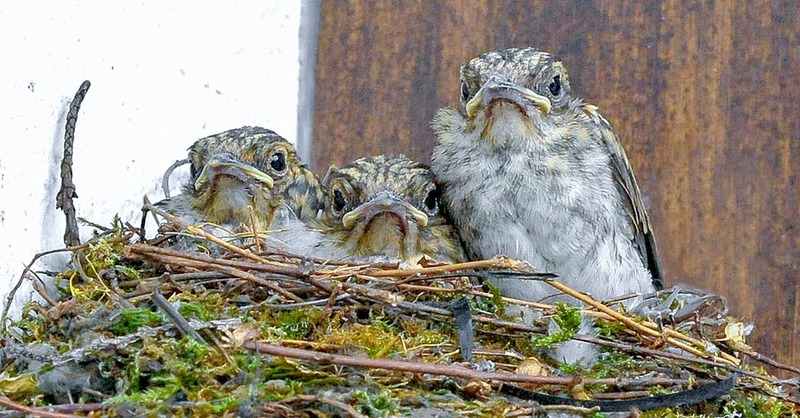 In fact, very often these artificial shelters when left free from previous occupations, are immediately occupied by the spotted flycatcher. As aforementioned, the livery of the spotted flycatcher is somewhat trivial even if worn with elegance. The base colour is grey cream spread in a paler nuance on the abdomen and a darker accentuation on the back and the remiges. On the chest are present light darker striations little accentuated and little marked covering irregularly the throat and the sides, leaving immediately room the grey cream of the lower part of the body. The remiges show the edge of the feathers paler that give transparency a light alar drawing. The bill, wide but pointed is greyish whilst the legs are of paler colour, at times fleshy. The young adolescents show on the chest that light spotting that maybe has been the cause of the assignment of its English vulgar name. Genders do not evidence any sexual dimorphism. The flight is fast and darting but also light and elegant and with frequent undulations in the case of long flights. The presence of a fairly long tail allows this bird to do abrupt and rapid changes of direction during the flight, with very fast wheelies and thrilling tackings. It is even very elegant in the posture when perched, with a haughty and regal position that renders it easy to distinguish from any other bird. Typical position of the members of the family of the muscicapids. It is about 14 cm long, weighs 15/20 g and has a wingspan of 25 cm. Seven subspecies have been determined of which four belong to the European-Mediterranean area. The Muscicapa striata tyrrhenica endemic to Corsica and Sardinia, the Muscicapa striata balearica typical of the Balearic Islands, the Muscicapa striata neumanni of the Aegean islands, Middle East and continental Asia and the typical Muscicapa striata striata of continental Europe, western Asia and the African populations. The three other subspecies are the Muscicapa striata inexpectata, endemic to Ukraine/Crimea, the Muscicapa striata mongola of Mongolia and of the Siberian territory close to the Baikal lake and the Muscicapa striata sarudnyi of the central Asian republics and of Iran. It is a bird with a fast nidification and with a good reproductive success even if the choice of sometimes exposed locations may lead to think the contrary. The anthropized species are in the mean time the most protected against the natural foes and therefore enjoy of a well ampler protection than that found in the natural environment. It does not have a well defined place where to nidify and therefore does it in any site offering a situation deemed suitable for doing it. We can find a nest in ample crack of a tree, under the beams of a porch, in an old swallows nest, on a pollarded trunk coverd by brambles or in unlikely places of our dwellings. Much loved are the nest boxes especially when furnished of an opening with balcony from which it can keep an eye on the surrounding environment. The nest is a small platform of dried herbs and small roots not particularly well done but comfortable with a not deep cup covered by finer and softer grasses with the addition of vegetal fibres. It lays from 4 to 6 cream eggs highly spotted reddish and quite similar to those of the robin (Erithacus rubecula) that are brooded for two weeks mainly by the female. At times can generate a second brood in the same season. The chicks, featherless and blind at birth, remain in the nest for two and sometimes three weeks, cared lovingly by both parents. The nest is occasionally parasitized by the Common cuckoo (Cuculus canorus). As the name itself recites, the spotted flycatcher nourishes mainly of flying insects in particular dipterans, hymenopterans and lepidopterans but does not hesitate to catch also small caterpillars placed on the lawn or on the leaves of the branches where is perched, always while flying and with a sudden and almost invisible darting. The populations of the Palearctic are particularly consistent therefore there are no incipient problems for the species.